Hullabaloo Quire and Grace Petrie wowed the packed audience on Sunday night at Sallis Benney Theatre. Their passionate Polyphonic Protest gig saw a sell-out crowd up on their feet joining Grace and the choir singing ‘Fire in Your Heart’ from Grace’s album, Whatever’s Left. Hullabaloo Quire’s mission is to celebrate the joyful power of the collective voice and to support positive social change through song. The choir regularly fundraises for local charities who support the most vulnerable members of our society. 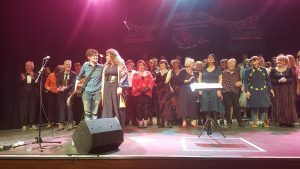 After their set, Hullabaloo was joined on stage by Frances Denham from the Clock Tower Sanctuary – a Brighton charity that works directly with socially and financially disadvantaged young people. Frances spoke about the charity’s flexible and holistic approach to supporting those in need. Relying on donations rather than government funding allows them to be flexible and responsive in their work, providing targeted support exactly where and when it is needed. A total of £340 was donated by the audience on the night, which was made up to £413.55 by Hullabaloo Quire members through a weekly donation pot throughout the term. Hullabaloo Quire are on Easter break now but will be kicking off their Summer Term in May, leading to Sing for Water Brighton – a benefit gig in aid of the charity Water Aid on Thursday, July 18th. They will then be joining forces with 800 other singers for Sing for Water London in September. 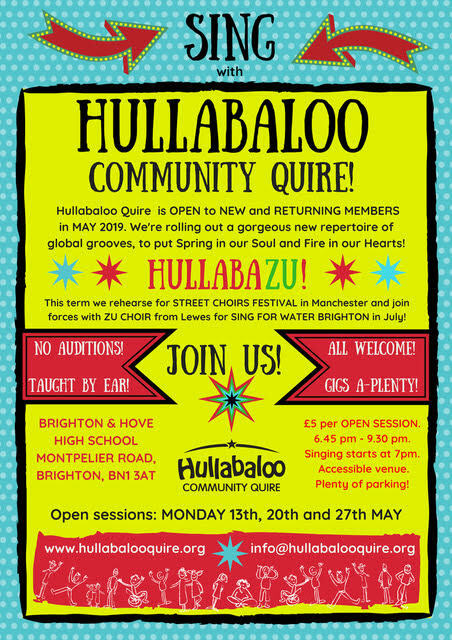 Hullabaloo Quire meets weekly during school term at Brighton and Hove High School and welcomes anyone who is keen to be part of a singing community. There is absolutely no need for members to be able to read music or to have any experience of group singing whatsoever. The choir has a varied repertoire, from pop to punk, baroque to blues, swing to soul and much more; a cornucopia of choral music influenced by global grooves and international rhythms. Through skilled support and guidance, Musical Director Kirsty Martin navigates Hullabaloo singers through the term towards performances of choral excellence! Hullabaloo Quire’s summer term commences on Monday 13 May 2019 at 6.45pm with three weekly Open Sessions where all are welcome, no auditions, no experience necessary. It will be a term of thirteen sessions working towards not only a performance with Zu Choir but a trip to Manchester for Street Choirs Festival, and an outing to London for a second Sing for Water event. Hullabaloo is the perfect choir for those looking for choral adventures alongside community activism. With flexible term fees on a sliding scale dependent on income, a bursary scheme and a completely open-arm, inclusive welcome, you’d be hard pushed to find a better way to spend a Monday evening!